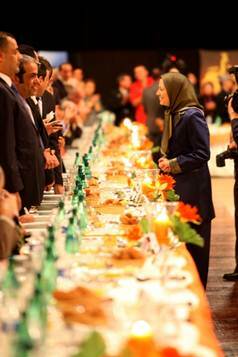 Referring to the escalating spread of discontent inside Iran, Maryam Rajavi said that before the eruption of popular outrage and prior to the overthrow of the Syrian regime, its closest regional ally, the regime in Tehran seeks to destroy the resistance movement as the most important factor in directing change in Iran. On Saturday, August 04, the International Arabic-Islamic Conference in solidarity with the Iranian Resistance in Paris with the participation of hundreds of Muslim personalities from 18 countries and parliamentary delegations from 14 Arab States, called on the UN General Assembly, Organization of the Islamic Conference, and Arab League to condemn Iraq for its repression against PMOI, and to force it to provide their humanitarian needs before the transfer process from Ashraf to Liberty is resumed. The participants from Iraq, Palestine, Jordan, Iran, Egypt, Algeria, Syria, Kuwait, Tunisia, Morocco, Lebanon, Bahrain, Yemen, Libya, Senegal, Turkey, U.S., UK and France asked UN and US to take urgent action in order to prevent a third massacre of Iranian dissidents in Iraq. The conference gave its support to residents’ eight- article practical plan that was provided to the UN on June 26 and reiterated that if Iraq refrains from fulfilling those minimums, it is showing to have ominous intentions. Based on this plan, the residents provide for eight minimum humanitarian needs at their own effort and expense, and then the sixth group will move to Liberty. If the Iraqi government does not hinder this plan, it will be realized in less than a month. In this gathering on the occasion of Ramadan that was presided over by Mr. Sid Ahmad Ghozali, former Algerian Prime Minister and Chairman of the Arabic- Islamic Committee in Defense of Ashraf, a large number of French Islamic dignitaries and Imams as well as Christian personalities and Patrick Kennedy participated or delivered their speeches. Also, Mrs. Bariza Khiari, Vice-President of French Senate, delivered her speech in the conference. 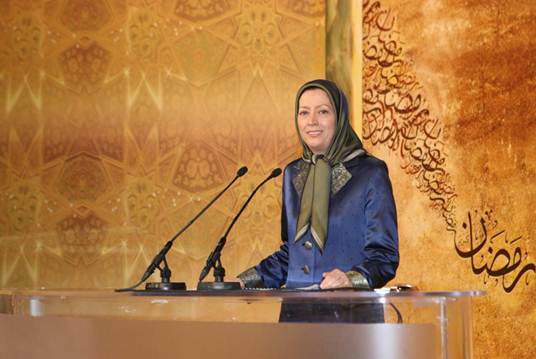 Mrs. Maryam Rajavi, the President-elect of the Iranian Resistance, was the keynote speaker to the conference who saluted Syrian people and their glorious struggle and their proud martyrs. She said that these sacrifices herald a strong message from the people in the Middle East that the time for dictators has come to its end. Today, while the Iranian regime is exhausting all its power to secure Bashar Assad’s regime, the Syrian people and their combatants are advancing their struggle toward victory. Referring to the escalating spread of discontent inside Iran, Maryam Rajavi said that before the eruption popular outrage and prior to the overthrow of the Syrian regime, its closest regional ally, the regime in Tehran seeks to destroy the resistance movement as the most important factor in directing change in Iran. She added: “Turning Liberty into a prison and preventing the Mujahedin from having access to minimum humanitarian needs, are all for the same reason. The crux of the matter as far as the Iranian regime is concerned is not the presence of the PMOI in Ashraf or Liberty or even their resettlement outside Iraq. At issue is the very existence of the PMOI, which the Iranian regime considers as an existential threat and seeks, therefore, to either physically destroy or coerce it into surrender. “The government of Iraq, according to plans and demands of the Iranian regime, has turned Liberty into a prison. She emphasized: “Meanwhile the United Nations and the United States claim, that the conditions and living standards at Liberty are satisfactory, will only help embolden Iraqi government and help its oppressive policies. With his biased remarks during the past few months and particularly in the latest meeting of the Security Council, the Special Representative of the Secretary General has emboldened the Iraqi government. Any harm comes to the Mujahedin from now on and any bloodshed, he will be directly responsible. “If the Special Representative truly believes that the humanitarian standards are met at camp Liberty, why does the Iraqi government refrains from opening the gates of Liberty to Parliamentarians, lawyers and even American officers who served for many years in Iraq and Ashraf? Pointing out that so far nearly 2000 Ashraf residents have moved from Ashraf to Liberty based on U.S. government’s explicit and written pledges, Maryam Rajavi underscored that the U.S. is now much more responsible vis-a-vis this issue. She called on the U.S. State Department to fulfill this responsibility; she warned if the GoI commits another crime against humanity, the U.S. government shall be held responsible.